I've started another purse. This one isn't necessarily for me, but may be a gift. It has floral fabric for the top, striped binding on the front pocket and the rest is brown with some colored flecks. 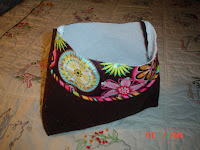 I will use both the floral and brown fabric as the lining with pockets on one or both sides. This is such an easy purse to make and I think I would like to make several for gifts.